In December we do not have a YE meeting. Instead we are invited to Merseyside Embroiderers Guild Christmas Party at Ullet Road. This year our YE competition was to decorate a card box shape. We had some wonderful entries , as you will see. The winner this year was Emma Lewis with her Nativity scene. Emma Lewis also won a Cup and had her name engraved on the Sreepur Shield as Merseyside Young Embroiderer 2015. Congratulations Emma! We had 8 members again this month and had a busy day. Becky Waite, from Up For Crafts which is sponsored by Radio Merseyside, came to visit and to collect all the completed sweetheart pincushions which we made last month to commemorat WW1. They will be in an exhibition in Central Library in Liverpool in Spring 2016. Today we made Christmas decorations. We made robin Christmas tree decorations from felt which were embroidered with blanket stitch, and then we made some heart decorations from paper strips machine sewn with ribbon, with everyone taking turns on our two sewing machines guided by Val. The next meeting of Merseyside YE will be at Merseyside EG Christmas Party held from 2pm – 4pm in Unitarian Church Hall, Ullett Road, Liverpool L17 2AA. This month we did not have Hilary with us as she was in America at her son’s wedding. There were 8 children including a new young lady named Carys. As well as finishing our 60th Anniversary brick we made sweetheart pincushions for the Up For Crafts people to commemmorate World War 1. Well the summer holidays are over and our YE group has met again today. We have an exciting time ahead, with an exhibition of our work to be held in Liverpool Cathedral in 2016, and also we have been asked by Radio Merseyside “Up For Arts” to participate in their World War I ‘sweetheart pincushion’ project. Also our two large embroideries “In Our Liverpool Home” and “Happy Planets” have been put on permanent display in Liverpool Women’s Hospital. Today we embroidered “fortune telling hands”. Each of the group drew around thier hand and put in all their lifelines and creases, then with the fabric in an embroidery hoop, used a variety of stitches to embroider over the pencil lines. When the are complete they will be made into cushion fronts of pictures. At lunchtime we celebrated Ailis and Fionn’s bithday with cake. Happy Birthday twins! We tried some counted canvaswork this month. Using a pattern, tapestry wool and a tapstry needle each we counted our stitches and followed the pattern to make some lovely fridge magnets. We added a sticky back magnet to each finished embroidery so they will stick to metal surfaces. We created a lovely display. Our YE Group does not meet in July or August, so our next meeting is on 12th September 2015. Happy summer holidays everyone! Our YE members enjoyed needlefelting when we made little Christmas stockings in November 2014, so we had another needlefelting day. This month creating landscapes and seascapes on a white felt background. The group each drew a plan on paper of their ideas, and then they used merino wool and a needlefelting needle to build up their pictures. After lunch these pictures were completed with embroidery stitches to build texture and outline parts of the design. As you may see all were very successful and will be on display at Merseyside Summer Party, to be held at Ullet Road Unitarian Church Hall, L17 2AA on Saturday 16th May 2015. We have a competition for our YE members which will be judged at the party – each member was given a wooden spoon to decorate at home- these will be voted for by visitors to the party – and the winner will receive a prize. So we await developments! Our YE group were invite to attend Merseyside EG Summer Tea party held in the Unitarian Church Hall, Ullet Rd, Liverpool l172AA. We had our ‘Golden Fleece’ embroidery on display, and there was a ‘Make and take’ activity to take part in. To make things interesting we had a YE competition, which was ‘Decorate a Wooden Spoon’. We got some wonderful entries, which you can see photos of below, and the winner was judged by public vote. Our winner was Ailis with her Owl spoon, and she won a prize. Well done Ailis! We had a new member this month. She is Zoe and Emma’s sister Esther. Welcome to Merseyside YE, Esther! We had our sewing machines out this month as we made cat faced bags and cushions. These were made from a fleecy fabric with whiskers and mouth hand sewn in stem stitch, and the main construction of the bag was done on the sewing machine. This was a new experience for some of our members but everyone managed very well and went home with a completed bag. All except for Fionn who made a beautiful cushion! We welcomed our YE Leader Val Heron back this month, and also welcomed Emma to her first YE meeting. We had lots of cake at lunchtime for a double celebration. It was Zoe Lewis’s birthday and she brought us a beautiful Victoria sponge she made by herself to celebrate. Val also brought cake to celebrate our triumphant First Prize win at the deDenne YE embroidery competition 2015. The theme was “All That Glistens”, and our group embroidered a goldwork ram with horns titled “Golden Fleece”. Congratulations YE! Our group was divided into two today, and we made Mothers Day gifts. Some of the members completed their applique cushions which they began last month. They learned how to use the sewing machine to attach the backs, then stuffed the cushions well to finish. The remainder of the group, who were not here last month made embroidered felt purses for their Mums. Unfortunately Val Heron, our YE Leader, was not feeling very well and could not attend this month’s meeting. We were pleased that Kathy kindly came to help To celebrate the arrival of spring we decided to make cushions from felt. These have a patchwork of squares joined together with applique flowers added. This month we got the background squares cut out and sewn together, and next time we meet we will add the flowers on top, sew the backs on, stuff, and make tassels for each corner. Merseyside Young Embroiderers submitted a Group Entry to the de Denne Competition. This is a national embroidery competition (named after the founder of the Young Embroiderers section of the Embroiderers Guild). 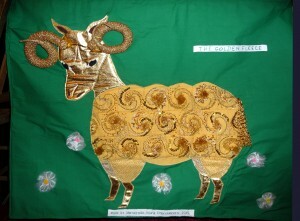 The theme for 2015 was “All that Glistens”, and Merseyside YE embroidered “The Golden Fleece” which is a golden ram with golden horns (photograph will follow soon). The entries have been judged and Merseyside YE has won FIRST PRIZE. Congratulations YE! We welcomed Emily and Grace to our first meeting of the New Year. We hope they both enjoyed the day spent stitching and will return again next time. Today we began a secret Group Project. When this project is complete all will be revealed, but for now all we can say is that it is a glittery creation, which our group has enjoyed working on today. We also learned how to make tassels.